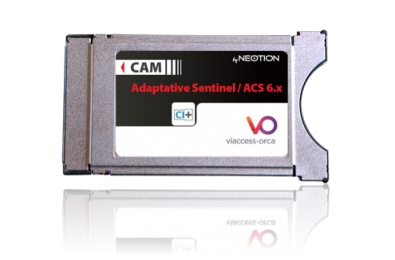 NEOTION confirms a longstanding working relationship, launching the first NEOTION CAM deployment with Viaccess-Orca Adaptive Sentinel dual card and cardless Conditional Access System (CAS) for a major European Operator. NEOTION extends its Viaccess-Orca product portfolio with a new CAM CIPLUS 1.3 certified with Viaccess-Orca's Adaptive Sentinel. Combining Viaccess-Orca software and hardware security, the NEOTION CAM provides operators with the best of both worlds: a smart card based solution remaining a foundation for security concerns of the major content owners while the cardless option allows for flexible and dynamic deployment for operators. This first deployment confirms the CAM as a suitable solution for the Pay-Tv industry ensuring premium content delivery via a small, smart and green device and enabling operators to mix card-based and cardless solutions to finally decide the best way to address the market with no more barriers. "Through the partnership, we are achieving a new step in the CAM business with Viaccess-Orca, offering our customers choice and flexibility in a secure way as the Pay-Tv market place is increasingly competitive and needs to be globally developed by exploring such innovation." "By bringing this innovative and cost effective solution to this Market with our Neotion partner, we demonstrate again the ability to adapt to specific market needs."